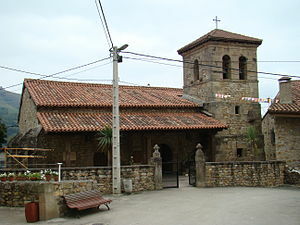 Parochial church of San Sebastián de Garabandal (situated in Cantabria, Northern Spain). The Garabandal apparitions are apparitions of Saint Michael the Archangel and the Blessed Virgin Mary that are claimed to have occurred from 1961 to 1965 to four young schoolgirls in the rural village of San Sebastián de Garabandal in the Peña Sagra mountain range in the autonomous community of Cantabria in Northern Spain. The visitations numbered in the thousands, drew huge crowds, and featured phenomena, much of it filmed or photographed, with thousands of witnesses. The Virgin Mary in this series of claimed visitations is often referred to as "Our Lady of Mount Carmel of Garabandal", because her appearance and dress looked like portrayals of Our Lady of Mount Carmel. Garabandal apparitions are sometimes referred as "the continuation of Fátima." The events at Garabandal began on June 18, 1961 when four girls eleven and twelve years old, Mari Loli Mazón (May 1, 1949 – April 20, 2009), Jacinta González (b. April 27, 1949), Mari Cruz González (b. June 21, 1950) and Maria "Conchita" Concepción González (b. February 7, 1949) said that they saw an angel. The angel made another appearance on June 25. The story quickly spread throughout the village. They subsequently reported seeing the Blessed Virgin. These claims continued for a number of years. In 1972, Mari Loli Mazón moved to the United States, where she would live for the next 27 years until her death in New Hampshire in 2009. Jacinta González became Jacinta Moynihan and is living in Oxnard, California, just north of Los Angeles with her husband, Jeffrey Moynihan and daughter Maria. Mari Cruz González lives in Aviles, Spain and is married with four children (Gabriel was born in 1975, Juan Carlos — in 1978, Lourdes — in 1981 and Ignacio — in 1985). Conchita González later went to the United States and married Patrick Keena in 1973; they live in New York City with their four children but they also maintain a house in Fátima, Portugal. As my Message of the 18th of October has not been complied with, and as it has not been made known to the world, I am telling you that this is the last one. Previously, the Cup was filling; now, it is brimming over. Many priests are following the road to perdition, and with them they are taking many more souls. Ever less importance is being given to the Holy Eucharist. We should turn the wrath of God away from us by our own efforts. If you ask His forgiveness with a sincere heart. He will pardon you. I, your Mother, through the intercession of St. Michael the Archangel, wish to tell you that you should make amends. You are now being given the last warnings. I love you very much, and I do not want your condemnation. Ask Us sincerely and We shall grant your plea. You must make more sacrifices. Reflect on the Passion of Jesus. Besides the two "messages", the visionaries forecast a "warning", a "miracle" and a "punishment" (if people do not correct their ways). The warning is described as a momentary stopping of time around the world, with all people then seeing the spiritual condition of their souls, and how they should amend their ways. Within a year of the warning, a miracle will take place. The miracle will leave a permanent sign in Garabandal, which can be seen and photographed, but not touched. The "miracle" will occur between March and May. The "punishment," or "chastisement," is conditional upon how humankind reacts to the preceding "warning" and "miracle." In addition to the predicted events, devotees believe a "small" miracle took place in the early morning hours of July 19, 1961. A photo, reproduced in all books and websites on Garabandal, is said to be taken from a film in which a Holy Communion wafer materialized in Conchita's open mouth, supposedly put there by an angel. The girls often claimed that an angel gave them Communion, and were frequently seen going through the motions of receiving the Eucharist. In January 1966 Conchita was called to the Vatican for an interview with Cardinal Ottaviani, Pro-Prefect of the Congregation for the Sacred Doctrine of the Faith. In February 1968 Conchita again went to Rome, to meet with Cardinal Francis Seper. 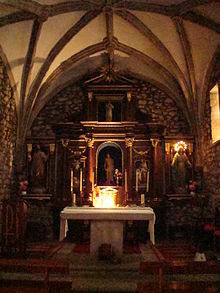 Altar of the Parochial church of Garabandal village. 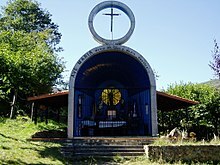 Small chapel placed in the mountain of Garabandal village dedicated to Saint Michael the Archangel. Past practice regarding approved apparitions indicates that in the absence of clear supernatural proof, neither the local bishop nor Rome is likely to approve an apparition. Authorities maintain a conservative attitude toward the apparitions. In accordance with usual procedure concerning claimed visitations, the Bishop of Santander has primary jurisdiction. Four successive bishops of Santander have viewed the supernatural character of Garabandal as unfounded. The Bishop of Santander determined a non constat—that is, the events could not be confirmed to be of supernatural origin. Regarding the alleged Marian apparitions at Garabandal, Bishop Jose Vilaplana stated that: "All the bishops of the diocese from 1961 through 1970 asserted that the supernatural character of the said apparitions, that took place around that time, could not be confirmed. [no constaba]. He further expressed the opinion that he did not find it necessary to reiterate this in a new declaration and give undue publicity to something which happened so long ago. In a letter to Archbishop Philip M. Hannan of New Orleans, Louisiana, dated April 21, 1970, Cardinal Seper, Prefect of the Congregation for the Sacred Doctrine of the Faith, stated: The Holy see has always held that the conclusions and dispositions of the Bishop of Santander were sufficiently secure guidelines for the Christian people and indications for the Bishops to order to dissuade people from participating in pilgrimages and other acts of devotion that are based on claims connected with or founded on the presumed apparitions and messages of Garabandal. In order to reply to certain doubts that you expressed in your letter this Sacred Congregation wishes to assert: that the Holy See has never approved even indirectly the Garabandal movement, that it has never encouraged or blessed Garabandal promoters or centers. Rather the Holy See deplores the fact that certain persons and Institutions persist in formatting the movement in obvious contradiction with the dispositions of ecclesiastical authority and thus disseminate confusion among the people especially among the simple and defenseless. On March 10, 1996, the Sacred Congregation wrote a letter to this effect to the Bishop of Santander, who had also asked for a more explicit declaration of the Holy See to the matter. "However, promoters of the Garabandal movement have tried to minimize the decisions and the jurisdiction of the Bishop of Santander. This Sacred Congregation wants it to be clearly understood that the Bishop of Santander has been and continues to be the only one with complete jurisdiction in this matter and the Holy See has no intention of examining this question any further, since it holds that the examinations already carried out are sufficient as well as are the official declarations of the Bishop of Santander. There is no truth to the statement that the Holy See has named an Official Papal Private Investigator of Garabandal and affirmations attributed to the anonymous personage to the extent that the verification of the Garabandal apparitions lies completely in the hands of Pope Paul VI and other such expressions that aim at undermining the authority of the decisions of the Bishop of Santander are completely unfounded. In 1975 Jacinta, the visionary, visited Rome in order to gain the Holy Year indulgence. The Bishop of Santander, del Val, had given her a personal letter of introduction addressed to certain Cardinals of the Sacred Congregation. She was received by Cardinal Ottaviani for 30 minutes. He told her, "Jacinta, I am with you, but we have to pray much and have much patience: it is necessary to pray that the Church will become aware of the importance of Garabandal." Cardinal Philippe, who was presiding over a Bishops' Conference, left it in order to meet her and tell her, "I bless you in the name of the Madonna and I am fully with you." She was also told, "It is very important that the four of you remain united." In an "Official Note" of July 8, 1965, Bishop Eugenio Beitia of Santander wrote, "We point out, however, that we have not found anything deserving of ecclesiastical censorship or condemnation either in the doctrine or in the spiritual recommendations that have been publicized as having been addressed to the faithful, for these contain an exhortation to prayer and sacrifice, to Eucharistic devotion, to veneration of Our Lady in traditional praiseworthy ways, and to holy fear of God offended by our sins. They simply repeat the common doctrine of the Church in these matters. "O'Neill, Michael (December 7, 2015). Exploring the Miraculous. Our Sunday Visitor. p. 224. ISBN 978-1612787794"
In April 2007 Joey Lomangino, founder of a large organization for U.S. Garabandal devotees, received from Conchita a copy of a letter dated February 12, 2007 from Archbishop Carlos Sierra of Oviedo. Sierra is the acting Apostolic Administrator for the Diocese of Santander in Spain, and the letter was addressed to a prominent Garabandal supporter in that country. On May 7, 1970, addressing a group of Garabandal pilgrims from St. Michael's Garabandal Centre, Brockton, Mass., the Pope blessed their banner. In his book Garabandal The Village Speaks, Ramon Perez concludes: "At the end of 1980 we are still at the same point: Rome takes the affair very seriously but officially she declares that it is the Bishop of Santander who must decide." Albrecht Weber wrote the book Garabandal Der Zeigefinger Gottes (Garabandal: The Finger of God) on Garabandal in 1993. A copy was presented to Pope John Paul II, who later asked his secretary, Fr. (later Archbishop) Stanislaus Dziwisz, to write to the author. In the subsequent printing (2000) of the book, on page 19, a portion of the Pope's message is reprinted, as follows: "May God reward you for everything. Especially for the deep love with which you are making the events connected with Garabandal more widely known. May the Message of the Mother of God find an entrance into hearts before it is too late. As an expression of joy and gratitude, the Holy Father gives you his apostolic blessing." Weber writes, "From the attached greeting in the Pope's own handwriting, with his signature, it is clear how deep an interest he has in the events of Garabandal, and how anxious he is that they should be made known in a credible way." From the book The Final Hour (Michael Brown) page 141 on the topic of Padre Pio's belief in Garabandal: “Asked on another occasion about its authenticity, he answered curtly, 'How many times must she appear there to be believed?'" Joey Lomangino’s recall of when he talked to Padre Pio: “We made arrangements to come back again that same day and greeted Padre Pio in the cloister. When we knelt down, we said to him, “Padre Pio, is it true that the Virgin is appearing to the four girls of Garabandal?” And he said, "Yes." We said, “Padre Pio, should we go there? He said, "Yes, why not?" And that’s how it happened. Because I received the assurance from Padre Pio that the Virgin was appearing and that he permitted me to go, then I wasn't afraid and I went." Mother Teresa, the Foundress of the Missionaries of Charity, said "It was in 1970 that I heard about the apparitions of San Sebastian de Garabandal for the first time . . . From the beginning, I felt that the 'events' were authentic . . ." (Letter of November 10, 1987, to Msgr. del Val). In his book Person and God in a Spanish Valley, W. A. Christian, Jr., who spent some time in Garabandal, suggests that the alleged apparitions arose from a perceived threat to traditional local beliefs and practices due to some changes resulting from the Second Vatican Council. Skeptical investigator Joe Nickell has written that the alleged Garabandal miracles came from anecdotal reports, never performed under reliable conditions or observed by experts in deception, such as professional magicians. According to Nickell they have "the earmarks of childish stunts and simple tricks." Nickell also noted that on three occasions the "Garabandal visionaries retracted some statements they had made about their experiences." ^ F. Sanchez-Ventura y Pascual, The Apparitions of Garabandal (San Miguel, 1966), p. 119. ^ Garabandal Film 08 - Second Message June 18th, 1965 on YouTube; video of the events preceding the apparition and Conchita during her reported ecstasy. ^ New York Center Update for May 2007, Workers of Our Lady of Carmel website. Webpage found 2009-01-08. Workers of Our Lady of Mount Carmel de Garabandal – Official Web site of the Workers of Our Lady of Mount Carmel. The organization was founded by Joey Lomangino in Lindenhurst, New York (1968). Pilgrimage to Garabandal – Web site of the Workers of Our Lady of Mount Carmel in Australia. St. Joseph Publications, a non profit foundation, was incorporated in 1973 to foster devotion to Saint Joseph and the Virgin Mary and make known messages given through apparitions. Books and videos of Our Lady’s apparitions, especially Garabandal and Fátima, are available on this site free for download. Garabandal Videos – Video Clips of the apparitions, with the letters from Bishop José Viliplana of Santander and Cardinal Seper.